I love alliteration. It’s short, it’s snappy, and it has a lot of mental sticking power. I’ve used it in the title of my interview with the Batgirl of San Diego, and when I named my self-indulgent essay comparing StarCraft and Barbara Kingsolver’s literature. This time around, I find it appropriate to utilize this literary technique in bringing attention to Star Wars. It’s not news to the movie fan or the Star Wars fanatic that there have been quite a few changes made in the rereleases of the classic films, old content packaged in a new format. A few of the alterations seem pretty logical [the Rebels’ computers are looking pretty dated when compared to the holograms of the prequel trilogy], while others are downright upsetting [replacing Sebastian Shaw with Hayden Christensen in the Jedi ghost scene]. With Blu-ray being the new format on the block, a new change has been announced for the rerelease of The Phantom Menace. Episode I can be remembered as the last of the Star Wars films to feature the diminutive Master Yoda using puppetry. There are no backflips or lightsabre fights with bearded Sith lords that nobody likes, just a short green alien with a penchant for reversing the order of his sentences, sitting down. After The Phantom Menace CGI was used to render the Jedi Grand Master. On the left, Yoda as he appeared in 2009. On the right, Yoda on Blu-ray. While this alteration causes the first of the prequels to fit in with the following two films, what it loses is a bit of its connection with the original trilogy. Yoda was voiced by Frank Oz, but he was also controlled by the man, who acted as a puppeteer for the first four films. While he’s certainly more expressive, he lacks a lot of the signature movements that once characterized him. But what does this say about film? Green screens are being used more than ever before, forcing actors to show fear, confusion, and even awe while standing in front of immense emerald sheets. While technology has been moving ever forward in delivering realistic CGI, it’s apparent that it still has a way to go. Consider the animatronic dinosaurs in Spielberg’s Jurassic Park. Created in the early 90s, it featured creatures that looked real because they were. They had actual size and weight and texture and you could have touched them if you were there. 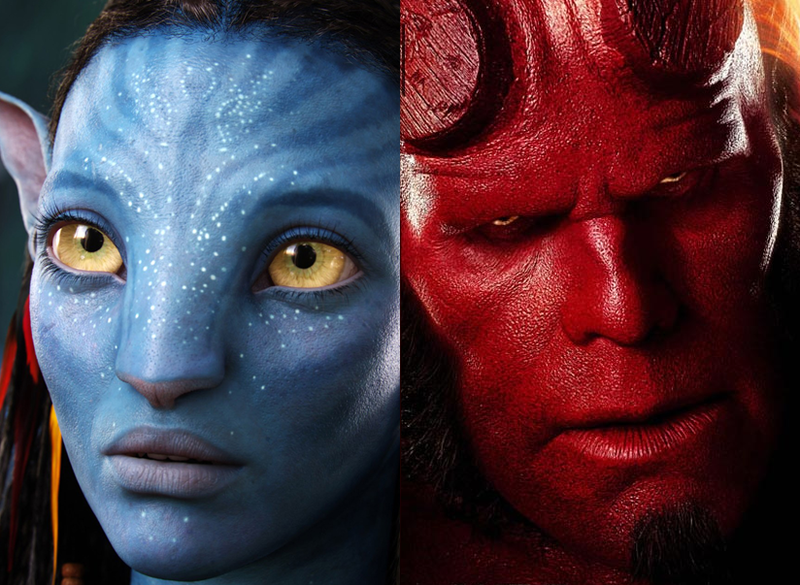 Compare Neytiri from James Cameron’s Avatar with Ron Perlman as Hellboy from the eponymous film. The difference from the left to the right is that of computer generated imagery to simple prosthetics and makeup. In an age when CGI seems to be taking over it’s always a pleasant surprise to see the more traditional techniques, be they puppetry or prosthetics, to help suspend the audience’s disbelief. When Hollywood’s pumping out real-world-meets-animated-characters films like The Smurfs, we can all thank God for Jason Segel.